This is a review for the supplement Excelerol. The manufacturer claims that this supplement will support memory, concentration and focus. Read on to learn more about this product and whether or not it it the ideal choice for you. Vitamin B 12- Works to support normal function of the nervous system, brain and the forming of blood. DMAE- Works to increase mood and alertness. Acetyl-L-carnitine- Works to prevent deterioration of the brain’s cells. Bacoppa Monnieri Extract– Works to decrease anxiety and increase cognitive ability, intellectual activity, motor learning ability and memory capacity. Gingko Biloba Extract– Works to improve memory, attention and concentration. Phosphatidylserine- Works to reduce risk of cognitive dysfunction and dementia. Alpha Glycerylphosphorylcholine- Works to improve memory and cognition. Please note: These capsules are vegetarian. It is recommended that one to two capsules be taken daily. There were no possible side effects listed on the manufacturer’s website, but it was noted that those with pre-existing medical conditions or those who are pregnant and nursing should consult a doctor before taking this supplement. This product is available at multiple prices for one bottle. For a 30 capsule supply, it can be purchased at $49.90. For a 90 capsule supply, it can be purchased for $99.90. Those with a monthly subscription can purchase a 90 capsule supply for $89.20. The first month of the subscription will cost $39.90. The manufacturer offers a 100% satisfaction guarantee with the purchase of this product. Customers who find that they are satisfied with the results can continue to purchase the product, while those who find they are dissatisfied have 90 days after the purchase to return the product for a full refund. The monthly subscription can be cancelled at anytime. The manufacturer’s website features multiple testimonials from customers who were satisfied with the product. This is a good sign that the product has worked for people who have used it. Excelerol is said to support memory, concentration and focus. There are testimonials on the manufacturer’s website that are positive and seem to back up claims about what this product can do. Although there are customers who were pleased with their results, buyers should keep in mind that individual results may vary, so there is a chance this supplement may not work for every person who purchases them. People may find these specific capsules appealing because they are vegetarian. Those with a restricted diet that doesn’t allow certain ingredients may be able to take this supplement because of that. The price may also draw in buyers, as it is affordable. There are multiple buying options for the capsules that offer the buyer’s the choice of 30 capsules or 90 capsules. There is also a deal for customers who become monthly subscribers that cuts the first month’s cost almost in half. The price coupled with the 100% satisfaction guarantee gives customers more of an incentive to try the product. 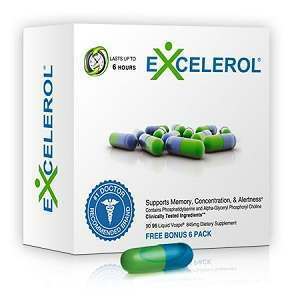 Overall, Excelerol seems like a good product and it may work for you depending on what you are looking for. Henry Costa	reviewed Excelerol	on June 17th	 and gave it a rating of 4.